This is as good a place as any to mention the Standard Model. It is not a theory like QM or GR, but it uses QM to build a “model”, i. e., a proposed explanation, of the constitution and properties of the elementary particles of which everything else is constituted. The principal elementary particles are the proton, the neutron and the electron, but there are many more. For instance, neutrons and protons (as well as mesons) are not elementary, they are composed of quarks. Warning: This presentation necessarily presents lots of new vocabulary. In addition, it sounds like numerology. But it works – with one notable exception, the force of gravity. However, gravity is thought to be negligeable at atomic scales (except when discussing black holes, which we are not). Basically, there are two type of particles, fermions and bosons. Bosons have spin (the particle’s angular momentum due to its spinning on an axis) which takes on only integral values – for instance, 0 or 1. They are virtual particles which carry the forces between other particles.igade. 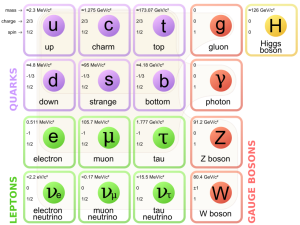 The quarks are said to differ by their flavor – up, down, charm, strange, top or bottom – which obviously is just an arbitrary term and has nothing to do with taste. They are arranged in three columns called generations. Quarks have charges +2/3 or -1/3; leptons, 0 or 1. Each of the six flavors of quark exists in three versions indicated (by analogy) by the colors red, green and blue1Not the same as the colors on the chart., for a total of 18. When forming matter particles, the quarks must group together in such a way that the result is “colorless”, so occur in the combination R+G+B for baryons like the neutron or proton, and R+R, where the bar above the character indicates an antiparticle, for mesons. Particles composed of quarks are called hadrons. Note that the mass of, for instance, a proton (about 938 MeV/c2) is far greater than the sum of the masses of its constituent quarks (2×2.3 MeV/c2 + 4.8 MeV/c2) . The excess, almost 99% of the proton’s mass, is potential energy of the strong force which binds the quarks together into the proton. As stated, bosons are virtual, force-carrying particles. Modern physics recognizes four forces in nature. Gravity is thought to be conveyed by a yet-to-be observed particle called the graviton (not shown because never observed and not part of the standard model — yet). It is a weak force (the weakest) but works across enormous, interstellar distances. We shall see that it is responsible for the formation of stars, galaxies and planets – no less. We owe a lot go gravity. The electromagnetic force between charges or magnets is conveyed by the photon, which is the particle of light. Like gravity, it has infinite range, but is stronger. Since its sources can be either positive or negative charges, the two cancel each other out over large distances, making the overall force weaker. The quantum theory of the electromagnetic force is called quantum electrodynamics, or QED. The strong force is the strongest, but is very short-ranged. It holds quarks together in the nucleus in spite of the repulsive electric forces between their charges. It is conveyed by the appropriately-named gluon. The quantum theory of strong interactions is called quantum chromodynamics, or QCD. The weak force is weaker than the strong or EM forces, but is still stronger than gravity. It also is a very short-range force. responsible for decays of various radioactive particles. It is conveyed by the W and Z bosons. So there two infinite-range forces, gravity and EM, and two short-range ones, the strong and weak. By order of strength, from strongest to weakest, they are strong, EM, weak and last, but in many ways not least, gravity. In principle, EM is be as far-reaching as gravity, but as you get farther away from, say, a positive charge, the more it is shielded by negative charges, so that the net charge seen is about zero. Gravity only has an attractive “charge”, so its effects extend over a very large range, over galaxies and more. As we shall soon see, that is a Good Thing! Now let’s get away from this weird physics for a while and look at evolution. 1. ↑ Not the same as the colors on the chart. It’s informative and good for a starter. (1) QM is a mess. If I say any more about it, I have to get into wave-particle duality and interpretation and so on, and that will make it not just a little longer. I will probably get around to that some day. (2) As a former physicist, I know QM fairly well. Because this site, as I say somewhere, is essentially an aide-memoire for myself, I don’t need it for QM.